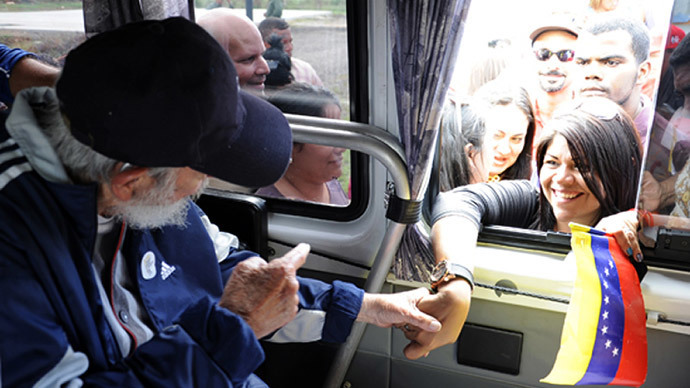 Former Cuban President Fidel Castro has made his first public appearance for more than a year. The 88 year-old met a Venezuelan delegation which had traveled to the island. Pictures showed Castro shaking supporter’s hands through the window of a vehicle. Castro made the appearance on March 30; however, it was only reported by Cuban state media on Saturday. It was the first time that the former Cuban president has been officially seen in public in 14 months. The revolutionary icon was wearing a blue and white tracksuit and a black cap, as well as a hearing aid. Pictures taken of the former leader showed him shaking the hands of supporters through the window of the vehicle he was traveling in. He also met 33 Venezuelans at a school, who had been visiting Cuba on a solidarity mission. Castro spent around 90 minutes talking to the delegation in the capital Havana. Granma, the official Cuban newspaper, said Castro “greeted, one by one and without any difficulties, the Venezuelans,” who were left impressed “by Castro's lucidity and his attention to the details of what is happening in Venezuela,” AFP reported. The report also added that “Fidel is full of vitality,” while Castro discussed “multiple details about life in Venezuela, especially now that this great nation has become the bull’s eye for imperial greed,” according to Reuters. This was in reference to US sanctions imposed on the South American nation, which Washington deems to be a security threat. Castro made his last public appearance on January 8, 2014 when he participated in a gallery opening for a longtime friend, Cuban artist Alexis ‘Kcho’ Leyva, also in the capital. In December, his brother Raul, who took over from Fidel in 2006, agreed to restore diplomatic relations with the US, the Caribbean nation’s historic enemy.